We decided to take a few days and get away as a late anniversary gift to ourselves. Our destinations often times involves food, in case you wouldn’t have guessed. 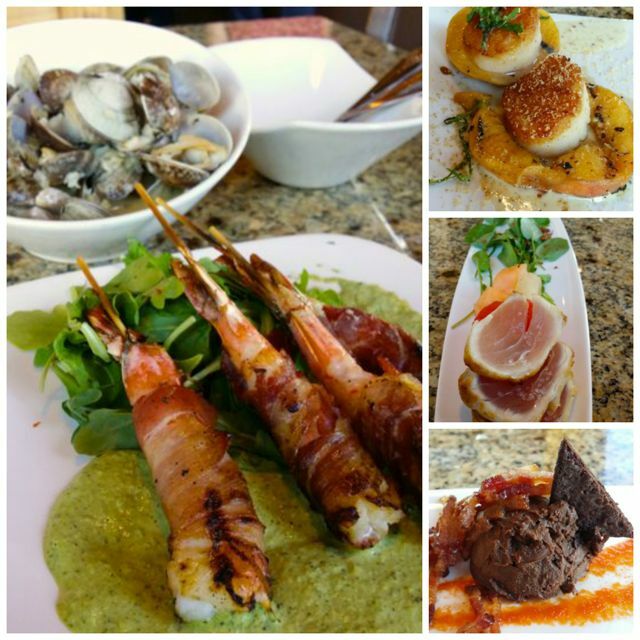 We chose Astoria because it is quite a foodie destination. 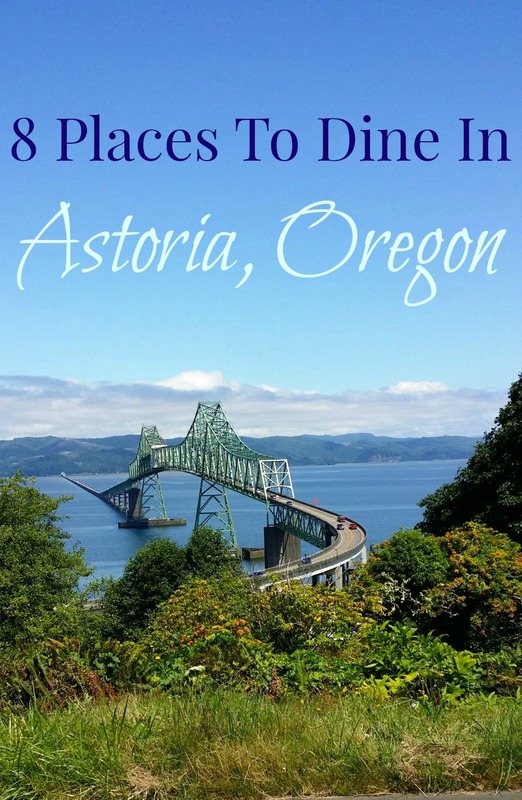 I have seen Eat Food Adventures takes tours up to Astoria, just so guests can Eat Their Way Thru this great little town. And not just eat, there are quite a few breweries in this town as well. 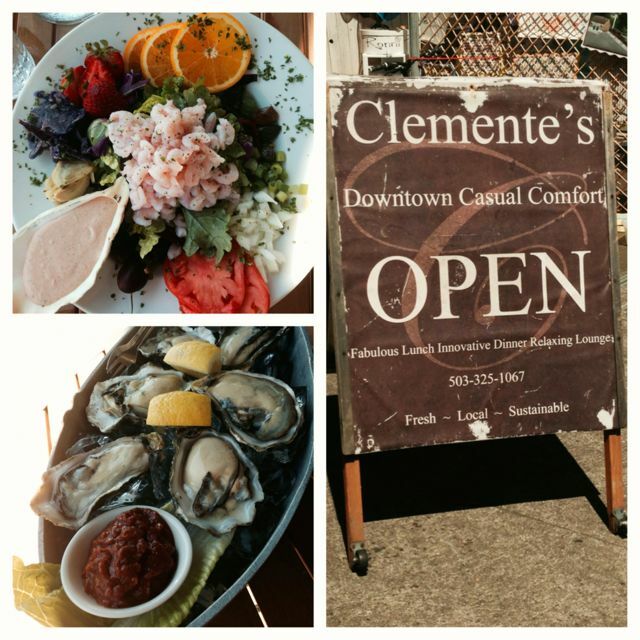 We started off with a lunch at Clements. Cute yet upscale dining here. The weather was not only beautiful, it was stunning the day we were there, so we chose to sit outside. The Sunday Farmers Market was going on, so there was plenty of people watching as we ate. We indulged in all things seafood this day. We were bummed that they did not have Dungeness crab, but they had everything else. Poke, Oysters (so fresh they shucked them right before they served them) and a big old Shrimp Louis Salad. Everything was fabulous and service was stellar. Atmosphere was more upscale even though they refer to themselves as casual. Prices were from $6-$12 on the lunch menu. I know they had quite a wine selection and some beers on tap, but we were saving ourselves for a brewery. When you have good weather in Astoria you have to take advantage of it, so we wandered down to one of the piers where the new Buoy Beer Company sits. We went inside to grab a sampler, but they aren’t quite set up to do that, although they said they will be ready soon. They did say we could sample any and all we wanted….so we did. We chose one of their IPA’s and headed to the front to sit in the sun and watch the Trolley go by. As we were walking away he told us to come back and sample any more that we wanted. 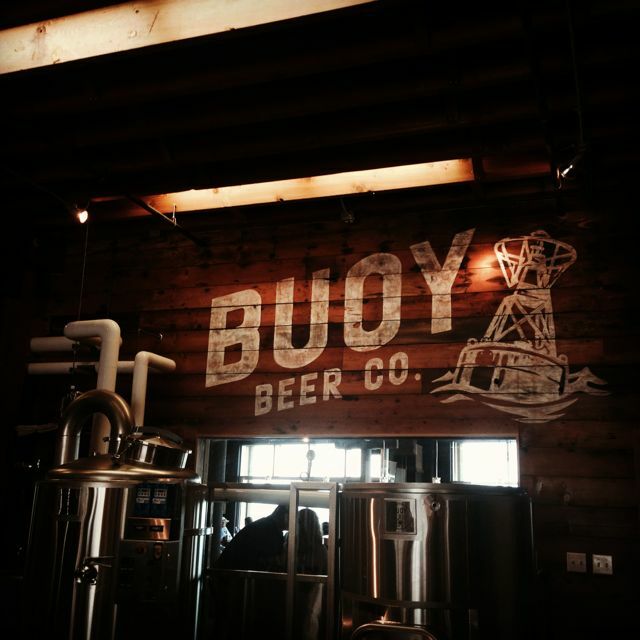 Great beer, great atmosphere and you can enjoy the view out at the water or just watching the trolley go by. We also heard the food was pretty good too. Kind of upscale pub food with seafood. Might be worth trying. Atmosphere is very rustic casual, plus great views from the pier. Service was great. They were helpful and willing to let us try anything and everything. Prices were spot on at $5 a pint. That evening for dinner we decided to head down to the piers again. This time to Baked Alaska. We had been here before years ago and knew we would be in for a treat! They had a short wait and said we could wait in the bar. We literally sat down, order our beers and they said they were ready for us. No need to close our account, they just push that tab over to the restaurant. Love this. Easy. We quickly ordered 2 appetizers. Bacon wrapped Prawns and steamed clams. As we were enjoying these I see they have a tasting option for $45 each. Well, since it was our anniversary dinner, we thought the splurge would be really fun. Bring it on. Every single thing was fresh, prepared perfectly and seasonally. Scallops with fresh peaches! Need I say more. We also got Ahi Tuna, which is what I would have ordered. What we received in the tasting was a half serving, we were told. The final dish was a Halibut, with asparagus and a pesto with a little jalapeno. Presentation was beautiful and I just dug right in without taking a pictures. Sometimes that happens. The tasting ended with a small dessert. Chocolate mouse with a sirracha sauce. Crazy sounding, but I liked it. This place is really special, plan to stop here for sure. Atmosphere is stunning. It’s on the water, so there are views from every seat. Service was great. Our waters were always full and we were being checked on regularly and we waited for nothing. Prices are a bit higher. We did the Chef’s tasting at $45 each. It came with 5 courses. Our hotel had a pretty impressive breakfast of eggs and toast, waffles, all kinds of cereal and hot oatmeal. All that to say, we didn’t eat breakfast out. We did decided to grab lunch before we left town. We couldn’t pass up Ft. George. 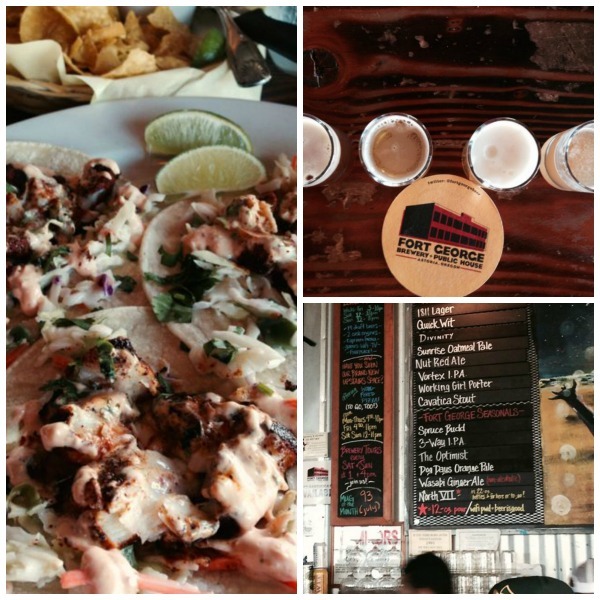 We sampled a few beers, grabbed some fish tacos and hit the road. We really wanted their pizza, but it’s only available upstairs and after like 4 or 5. When we were there on Sunday this place was hopping. On Monday it was much easier to get into. It’s a very popular place, check this place out too. Atmosphere is lively and loud, yet very cool. Plenty of outdoor seating too. We did manage to hit one coffee shop. We had walked past this one and it intrigued us by its “Portland” look. 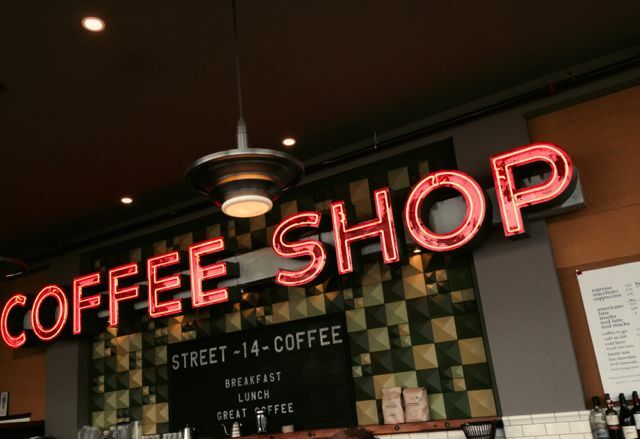 It had such a great feel inside and they were using Stumptown coffee. We grabbed a few small pastries and a coffee and sat out in the sun and people watched. When the sun is out in Astoria the place is quite the buzz with activity. Atmosphere was really cool and I was later told there is a Wall of Found Things. No clue what that is, but be on the lookout if you go. Service was ok. I don’t have a lot of requests with my coffee, I just don’t like it as sweet and I love it extra hot, this seemed like a big request. But she eventually warmed up to us. Price for my 8oz latte was $4. Albatross was on our list, but it was not open the weekend we were there. It was a holiday weekend, so that may have been why. Also Blue Scorcher is a great place for a sandwich for either breakfast or lunch, but we never made it there either. Bowpicker is a food cart of sorts serving Fish and Chips and when we went by the line was very, very long. Too many places and too little time. 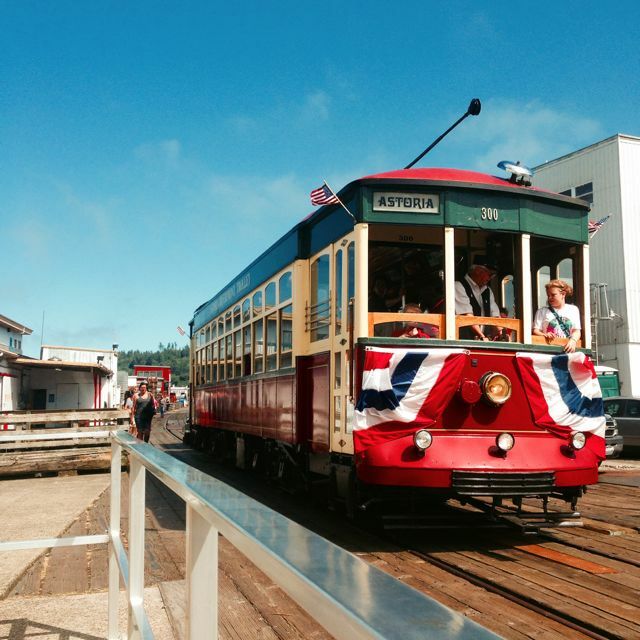 Check out 12 things to do in Astoria while you are there. There are some great ideas to work up an appetite. January. 2015-The land under Bowpicker is being remodeled. I saw the boat parked a few blocks away . . . obviously no longer open. Bowpicker is temporarily closed. You can follow them on Twitter for the updates. I heard that Blue Schorcher is always like that and you need to plan for the line. Albatross was closed for an expansion renovation. Adding a seafood/oyster bar to the mix.